As the weather cools, a great scarf is an essential accessory. 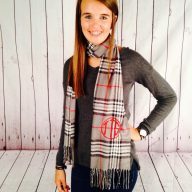 I Flew the Nest has a variety of monogrammed scarves for women. From knit infinity scarves that offer the utmost warmth, to stylish chevron infinity scarves, to the classic cashmere scarf, and the youthful pom-pom scarf, we’re confident that you’ll find a monogrammed scarf that’s just your taste. 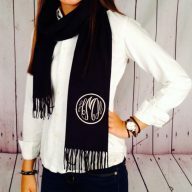 Dress up any outfit with I Flew the Nest’s monogrammed cashmere scarf. This accessory will add color to any ensemble, while keeping you warm on cool days. 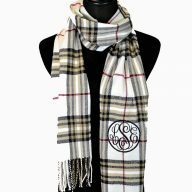 Buy purchasing this monogrammed scarf, you can add a personal touch to a wardrobe basic while also enjoying the soft cashmere. Whether you’re looking to get a lavish gift for a friend or co-worker, or want to have the luxurious cashmere all to yourself, this limited edition I Flew the Nest design is sure to please. Our cashmere scarves also come in an array of colors and prints. Need a scarf fast? I Flew the Nest offers speed and quality with a 24-hour turnaround time. 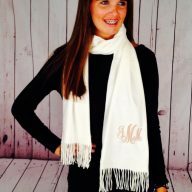 When you buy monogrammed apparel from us, you don’t have to worry about waiting for your personalized piece. 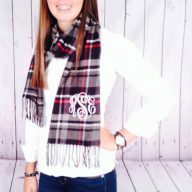 With numerous options, speedy turnaround, and friendly customer service, I Flew the Nest truly is your one-stop-shop for the perfect monogrammed scarf. 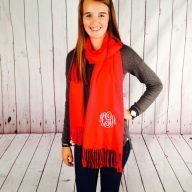 Learn more about our monogrammed scarves for women by calling us at 877-784-5849.